Governor Ibrahim Shekarau has said repeatedly that it is wiser to sacrifice a few number of children to polio today than to endanger a whole generation in the future. To some people this statement sounds controversial and unreasonable. But the governor has maintained his position and indeed Kano, the most populous state in northern Nigeria, is not taking part in the polio vaccination exercise. Governor Shekarau started work as a mathematics teacher, after graduating from the Ahmadu Bello University in the ancient city of Zaria. He rose through the ranks, to become a principal, then a director and ultimately a permanent secretary, the highest office in the Nigerian civil service. He is a newcomer to Nigerian partisan politics. 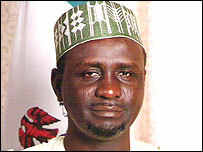 Governor Shekarau served as permanent secretary under his predecessor. He was said to have fallen into the bad books of his boss and was demoted and then sent back to work as a classroom teacher. This eventually forced him to retire from the civil service. But he bounced back when powerful interest groups who wanted to oust the former governor supported Mr Shekarau's candidature. He won elections last year and today he is governor. On assuming office, he promised to make human development the main focus of his administration and also pledged to implement Sharia, strict Islamic law. Governor Shekarau is a down to earth person. He always mixes with local people and does not wear expensive clothes. To Islamists, Governor Shekarau today surpasses Zamfara state governor Ahmad Sani, the first man to reintroduce Islamic law in northern Nigeria. His total rejection of polio vaccines has now gained him even more publicity, surpassing by far what his supporters could have imagined. At every opportunity - and these come daily - Governor Shekarau maintains that Kano state will only allow the polio vaccination exercise to be held if his trusted scientists are proved wrong. 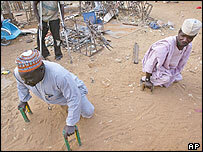 They say that the polio vaccine is in fact a western plot to make African women, in particular Muslims, infertile. These claims are emphatically denied by the World Health Organisation. But Mr Shekarau says that any agency or government contesting the results of the findings of his scientists must bring their own scientists to work alongside his trusted team. In the end, the team should come up with a joint result. If his scientists are proved wrong, then and only then will he give in.